Posigrip™ Straight Needles GET QUOTE! These non-coring straight Huber Point Needles have a "B" bevel and a unique knurled hub. The hub provides positive grip action when securing the needle to a syringe or Luer Lock. The needles are available in various gauges and lengths and are colour coded for your convenience. They are individually packaged and shipped in quantities of 12 per box. Huber Point Needles offset 'B' bevel point, rather parts than pierces the silicone septum of vascular access ports. Therefore Huber Point Needles are required to access all vascular access port models. All PosiGrip needles can be supplied with rubber injection caps. These are ideal for repeated access applications. A 'C' after the catalog number denotes the injection cap. Injection caps feature a male luer and rolled over design. They can be purchased in boxes of 100pcs. * Add C to the ordering code to add an injection cap. Luer stub adaptors are the ideal way to temporarily connect a syringe to a catheter. The adaptors have a blunt tip and have a colour coated plastic hub for easy gauge identification. They are available with or without injection caps in a wide range of gauges. The Right Angle Infusion Sets feature a right angel Huber Point needle and grip block bonded to Tygon tubing with a female luer lock. The sets are supplied individually sterile packaged, 12 per box. Right angle sets are available in a variety of gauges, needles and extension tubing lengths. Custom infusion sets can be ordered. Tether Infusion Sets are available with a Huber Point or Blunt Needle attached to Tygon extension tubing. The sets feature a female luer lock and are packaged sterile, 20 per box. They are available in a variety of needle gauges, needle and extension lengths & materials to suit your requirements. Tygon Extension sets featuring male and/or female luers are available in a variety of lengths. They are individually sterile packaged, 10 per box. Custom extension sets can be ordered. The ClearView Infusion Sets feature a clear flexible disk attached to a Huber Point Needle. The disk lies flat against the skin ensuring needle stability. CVRA sets are available with or without suture holes, in a variety of needle gauges and lengths. Custom sets can be ordered. 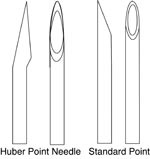 To appreciate the Huber Point Needle and why it is important to Vascular Access Port users, a short discussion of needle point geometry & style may be helpful. The term bevel refers to the angle surface formed on the needle shaft when sharpened to make the needle point. Bevel length is the longest distance of the bevel measured from the tip of the needle to the most proximate area of the grinding behind the heel. An "A" bevel needle does not have the longest and sharpest point and is used in blood collection as it slides through the skin very easily. The tip is very delicate and can easily be deflected or damaged. The "C" bevel needle does not have a sharp point and is therefore sturdier and less delicate. It is used in applications such as piercing a rubber stopper. The "B" bevel needle has characteristics in-between the A & C bevels being relatively sturdy & sharp. NON-coring Huber Style Needles are "B" bevelled needles with a relatively sharp point. The heel is sandblasted to minimize coring and the point/tip is deflected. The tip is raised above the center line to minimize contact with the tissue or media. Our Huber Point Needles and Right Angle Infusion Sets feature the shorter "B" bevel needle tip. This is often referred to as the protected bevel because the cannula is bent over. The 'birds eye view" comparision of the huber and the traditional point will allow you to see that the point of the huber needle is offset or protected, and that the eye lies parallel to the needle shaft. This configuration is key to its ability to penetrate a port septum without coring a plug of silicone. How do you measure a needle size? Needle sizes are typically referred to as 'gauge' size. A gauge denotes the outside and inside diameter of the stainless tube that is attached to the hub. Gauge sizes have an inverse relationship to their number e.g., a 30G needle (G=gauge) is much smaller than a 20G needle.